After passing its MOT my Griffith 500 suddenly ground to a halt on the return journey, the fuel pump refused to operate. The usual cure is to change the fuel pump and ECU relays in the passenger footwell but this had no effect. Suspecting that the fuel pump itself had failed I had the car towed home. On later investigation the fuel pump fired up when connected directly to the battery so the fault had to lie elsewhere. The fault then became intermittent but every attempt to trace the cause was inconclusive. 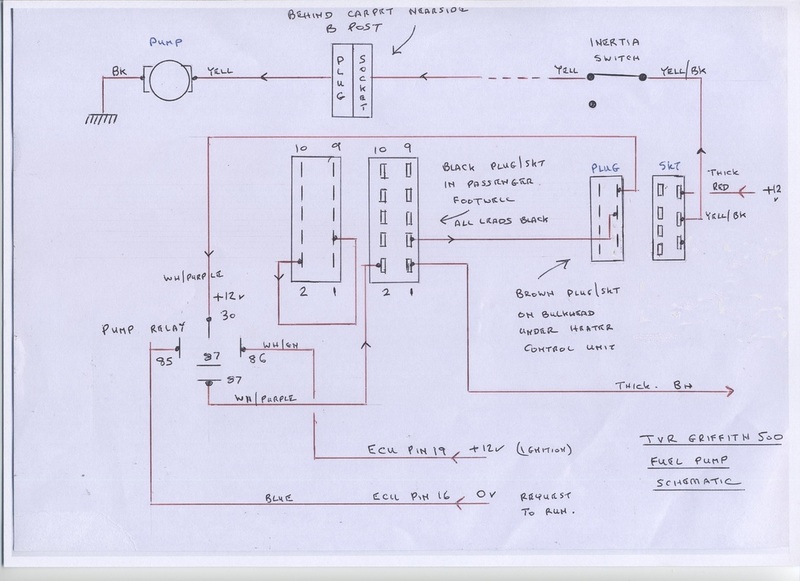 I decided to trace the complete fuel pump circuit to identify the problem. I was surprised to see no less than three plug/sockets in the circuit. The wires to the black plug/socket in the passenger footwell form part of the immobiliser circuit and to confuse potential thieves (and owners) are all black in colour. The Meta car alarm/Immobiliser can immobilise three circuits, but only two, the starter solonoid and the ignition amplifier are connected in my car. All connections are routed to the socket while the plug has jumpers to connect various socket pins together. The12 volt positive feed from the fuel pump relay is connected to pin 2 of the socket and exits via pin 3 to the brown plug/socket located under the heater control unit behind the dash. The 12 volt feed is then routed through the inertia switch, via another plug/socket behind the nearside B post eventually reaching the fuel pump under the nearside rear wheel arch. The other fuel pump connection is earthed. While tracing the circuit I cleaned all the plug/socket connections and the relay contacts and the intermittent fault cleared itself so I assumed it must have been a dirty contact somewhere. The Inertia switch is located behind the glove box and stops the fuel pump in the event of a collision. Sometimes it has been known to operate under extreme braking but can easily be reset by pushing down the plunger on top of the device. The plunger can just about be reset by reaching in behind the open glove box. Other possible causes of bad connections are the plug/socket behind the nearside B post as rain ingress frequently leaks in here and can corrode the connectors. The pump connectors under the car are subject to all sorts of battering during normal driving so are really the first items to check if the pump stops.